I thought I was just taking advantage of the last of the local produce at the co-op, but it turns out I was making a pretty, pink meal during the week of Valentines. The color in the photo is slightly off, though I tried to mess with it in photoshop; in reality it is a very lush, lascivious magenta. Also, I think it tastes better if you cook it in a complimentary aqua-blue pot (as seen in the background). This is my friend Katherine's recipe, slightly modified. Preheat oven to 350. Peel and roughly cut the beets, potato, carrots, and parsnip; coat with olive oil and roast in a dutch oven for 25 minutes. Peel and roughly chop the onions and garlic, add them to the pot, and roast for another 25 minutes. Bring pot to stove top, cover vegetables with broth, and simmer until vegetables are very soft. Add lemon juice and season with salt and pepper. Blend well. 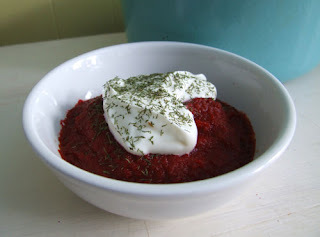 Serve hot, with a dollop of sour cream and a sprinkle of dill in each bowl.